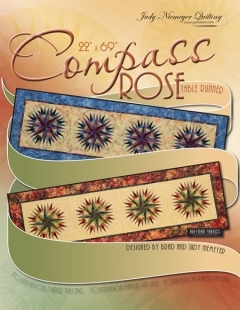 The Quiltworx Compass Rose Table Runner Pattern is the central pattern for many of Judy’s larger quilts and thus is a great introduction to her foundation paper piecing technique. This class is appropriate for confident beginners as well as experienced quilt makers. The pattern contains enough papers to make two 22″ x 69″ Table Runners (6 Rose blocks). Replacement packs are available that include only papers so you can make more if you please! If you prefer, instead of sewing them in a table runner design – these blocks can be stacked and made into a beautiful wall hanging. If you want to make a larger quilt – additional foundation papers can be purchased without the full expense of a second pattern.